You may have noticed a decrease in early morning traffic on your way to work from October 7th to 11th. That’s most likely due to International Walk to School Week (iWalk), which had 191 schools and over 60,000 students skip their morning car rides for a nice walk instead. As the coordinator for the iWalk school visits, I was able to see schools in action during their iWalk week. It was amazing to see what each of the schools had planned and how excited all the students were so early in the morning. Although all the schools were amazing, there was one particular experience that really embodied all of DASH’s values; fun, learning, balance, collaboration, and contribution. As we were saying our goodbyes at Trafalgar Elementary, we noted that it was great to see so many children walking to school so enthusiastically. One PAC member then mentioned that it’s not easy getting them to walk, especially at her son’s school, St. John’s School. She told us of the difficulties her son faced trying to cycle to school with all the traffic and idling cars and about the staff’s efforts in encouraging students to walk to school. We visited St. John’s the very next day and discovered that they were not registered for iWalk; I was immensely impressed with the staff’s initiative to get students walking. 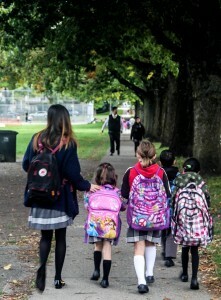 Because St. John’s is an independent school, their students come from all over the lower mainland, making walking a nearly impossible option. However, nothing is impossible, so St. John’s set up a tent a few blocks away from the school that would provide a safe drop-off site for parents that have to drive. The tent had older students ready and waiting to walk the younger students to school. I think my heart actually melted watching the big tall seniors and the tiny little elementary students walking to school hand-in-hand. St. John’s saw an increase in students walking and decrease in traffic as the week went on and will encourage their students to continue. I learned that there are many schools out there doing amazing things and how important it is to make connections for without the Trafalgar parent’s contribution, we would not have known about St. John’s School’s efforts. It really is incredible to see such community and school connectedness, watching the students and teachers collaborating at the walking tent was great. Of course, getting to go out and visit the schools was a lot of fun and helped to create balance between work, play, and learning in my day. Did your school participate in iWalk? Do you have a story to share? DASH would love to learn from you too! Submit your story on the Healthy Schools BC Stories Map.